O.K., the name is a mouth full, I didn’t even mention the Cream Cheese Frosting! But, if you want something pretty simple, but is delicious and elegant, you’ll want to make this cake. The batter will be very dense and you’ll have to spread it around the three – eight inch pans with a spatula. It’s great for a large dinner party or celebration!! Preheat oven to 325 degrees. Spray Pam for baking on 3 -eight inch cake pans, line the bottom of the pans with parchment paper cut to size. Set aside. Put all the ingredients in the mixing bowl. Mix on low first, then medium speed for 1 or 2 minutes to combine well. Place in heated oven for 30 minutes. Allow to cool completely before going on to the next step. Whip the cream with the powdered sugar until soft peaks appear. Make sure the cream, bowl and paddle are cold if you can, it whips better. Turn one layer upside down on a serving platter. Spread half the Nutella over the surface of the first layer. 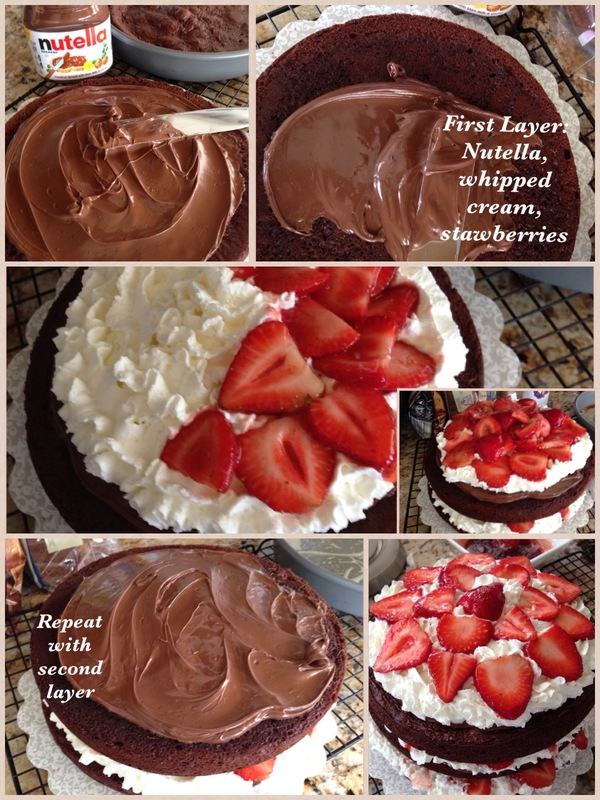 Spread half the whipped cream on top of Nutella and top with 1/3 strawberries. Place the 2nd layer on top and repeat with the same layers. Top with the 3rd layer of cake. Frost sides of cake with the cream cheese frosting, then frost the top. 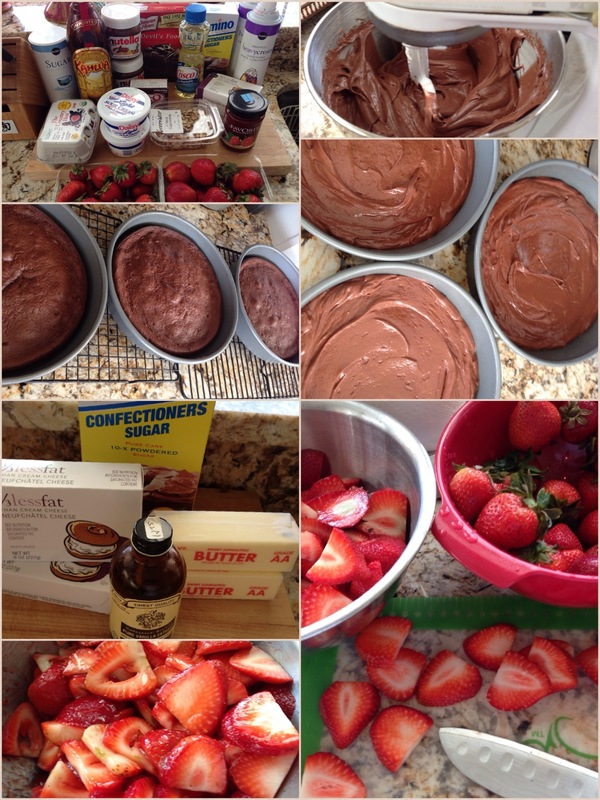 Place slice strawberry in single layer with the point up, along the bottom of the cake. 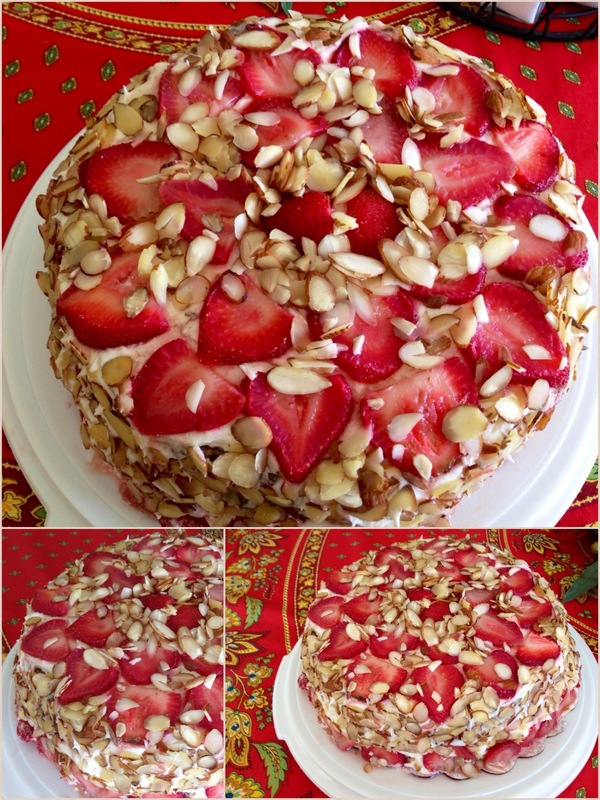 Place slices of strawberry on the top in a circular pattern until top is covered with sliced strawberries. 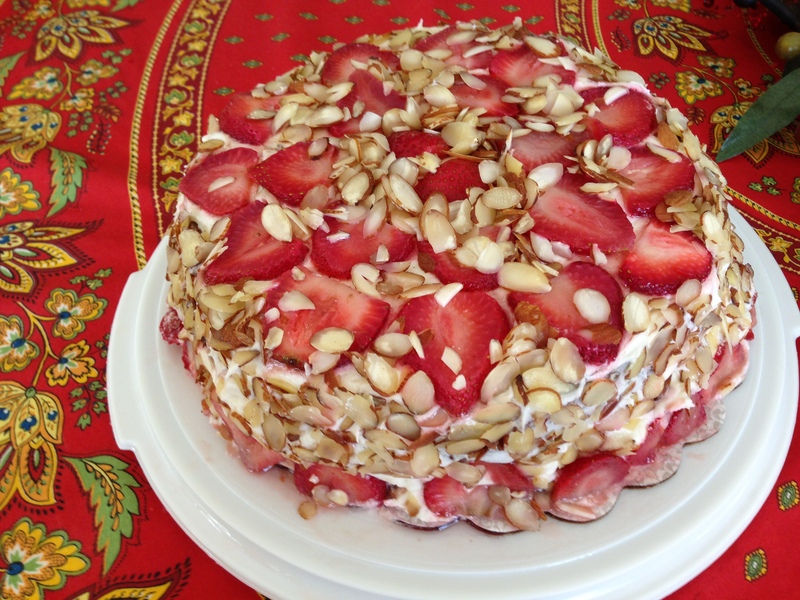 Fill in gaps with sliced almonds on top and press almonds around the sides of the cake. (see pictures). To serve: (Optional) Cut slice (not to thick) and place on dessert plate. 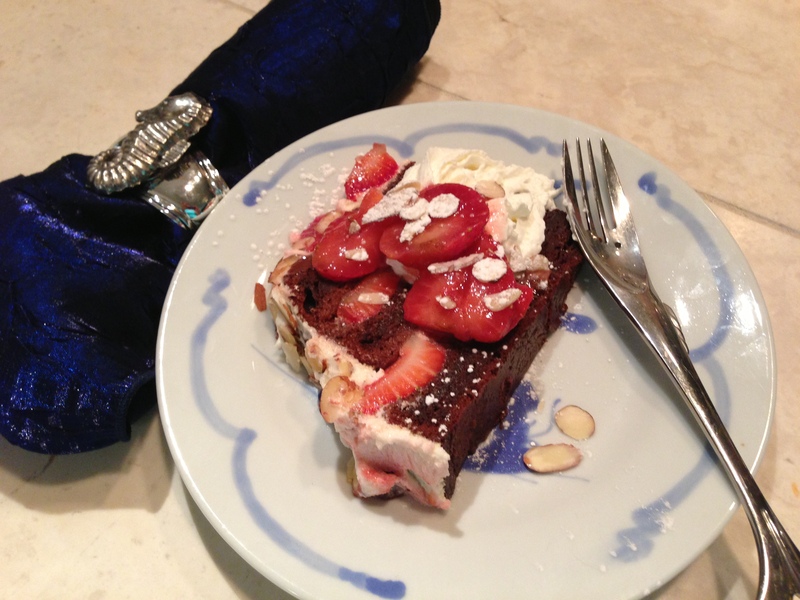 Place dollop of whipped cream, a few strawberries, and sprinkle with sliced almonds and shake some powdered sugar on top! This entry was posted in Desserts and tagged brownie cake, cake box cake, CHOCOLATE, CHOCOLATE CAKE, cream cheese frosting, dessert, Kahula cake, nutella, nutella cake, sour cream cake, strawberry cake. Bookmark the permalink. WOW!! That looks amazing as usual Mom… Great job, I bet it was delicious! Thanks Mitch, it sure was! Very rich, you can only eat a small piece. Mary you continue to top yourself! What a beautiful cake…will use it someday for company! Mercy, thanks for your comment! I do get carried away sometimes!! I AM SO MAKING THAAT!!!!! Thanks Mary! Hope you like it! !